OSU’s head man takes no days off. Mike Boynton simply cannot stop recruiting. On Tuesday night ahead of OSU’s Wednesday night game against Tulsa in Tulsa, the head man — along with some of his staff — paid a visit to watch Booker T. Washington star Bryce Thompson take on Sapulpa. Thompson, a 6-2 shooting guard, is ranked as the No. 69 prospect in the 2020 class, the No. 1 player in Oklahoma in his classification and the No. 18 player at his position nationally, according to the 247Sports composite. A really nice four-star prospect, he has close to a dozen offers from KU, OU, Texas A&M, OSU and others. 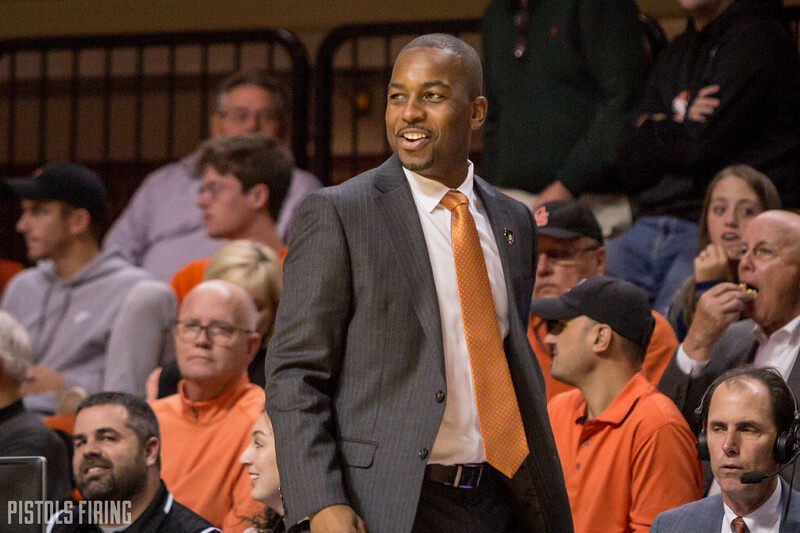 Boynton’s obsession in recruiting has paid major dividends for Oklahoma State. In the 2019 class, which appears to be wrapped up, he put together an impressive four-person class filled with three four-star prospects and one three-star — a class that ranks 15th nationally and third in the Big 12. Even more impressive: Boynton was out just days after scoring a big recruiting victory for 2020, landing four-star guard Davonte Davis out of Arkansas. It’s early, but the 2020 one-man class ranks first in the Big 12 and sixth nationally. So what, if any, impact does Davis’ early pledge have on Bryce Thompson? Little to none, it seems. OSU has made Thompson a major priority and has recruited him to play either guard position, so Davis’ commitment shouldn’t change that goal. Perhaps with Davis’ early commitment, the staff made an extra effort to see him Tuesday to signal that their interest in the wake of the early recruiting win hasn’t changed.